​Choosing when to visit Antarctica is a​ crucial part of the planning process and should be one of ​your primary considerations. ​Having decided in which year to travel you need to zero in on your preferred time, taking into account each month​'s​ distinctive ​weather and wildlife characteristics. During autumn and winter much of Antarctica's coastline is impenetrable due to thick ice and temperatures that can drop to -60 degrees. The best time of year to visit is during the Antarctic summer from November to March, when you'll see Antarctica's wildlife at its busiest and benefit from up to 24 hours of daylight. Due to strong demand and the relatively modest number of ships, particularly during High Season, to be confident of securing your first choice we would strongly urge that you begin planning at least 12 months in advance. For the most popular Fly & Cruise trips or those incorporating South Georgia, 18 months ahead isn't too early. January is the peak of the Antarctic summer, so you'll enjoy magical 20+ hours of sunlight each day. These extra daylight hours gives you more time each day to explore, making them very popular as you get to see a bit more of the Peninsula in the same number of days. The slightly higher prices for early January reflect this popularity. Also in January you'll see lots of penguin chicks having fun as they learn to run away from their mothers, and seals of various species abound. February's the time for sailing all the way to the Polar Circle, the Sun's rays through December and January having weakened the pack ice significantly enough to allow for exploring the Peninsula so far south. Photographers will appreciate the great light conditions, whilst wildlife enthusiasts will love the "penguin creches" formed by the growing penguin chicks and the return of whales to Antarctic waters. March marks the end of the travel season to Antarctica. You'll be able to enjoy the mesmerising colours of blooming green and pink algae against the water and ice, as well as penguin chicks at their strongest, bravest and most inquisitive of visitors. The whales continue to feast through March in Antarctic waters before moving further north. As Autumn dawns once more you'll have shorter days in which to explore, but also enjoy considerable savings compared with peak season. In November Antarctica opens its arms to the season's first visitors. You'll not only enjoy the excitement of walking on virgin snow, but you'll also appreciate its beauty as you discover the Peninsula aboard one of the few early visitors. It's mating season for penguins, who will treat you to courtship displays and their nest-building. Seals of all kinds are also beginning to mate. Landscape photographers, meanwhile, will love the distinctive outlines of the giant icebergs cut against the sea and sky. The summer sun bathes the continent in 20-24 hours of daylight in December, making it a popular time to visit. It's also a busy time for the penguin rookeries as the chicks begin to hatch from mid-December onwards. The Christmas holiday period adds to the popularity, and prices tend to reflect this. However you'll be treated to seals abound as they seek suitable mates and landscape photographers are treated to the still-crisp edges of great icebergs. I spent eleven summer seasons in Antarctica and I genuinely don't have a favourite time - it's a place of such variety, constant wonder and excitement. When should I start planning my Voyage? When are departure dates normally released? ​Polar​ operators ​typically release their ​forthcoming departure dates ​and prices at least 18 months ​or so in advance, some even earlier. This is great news for travellers who like to plan ahead and get their cabin reserved early on​, particularly if you can take advantage of an early booking incentive. Given that there is only a finite number of places available on each departure, it really is a case of 'the early bird gets the worm' - or in this case the best dates and the widest choice of cabins - so early booking is strongly recommended. When should I start to plan my Fly & Cruise trip? Trips which include time-saving flights to Antarctica and avoid the Drake Passage are incredibly popular and are the earliest of all voyages to become booked up. Due to strong demand and the relatively modest number of ships, particularly during High Season, to be confident of securing your first choice we would strongly urge that you begin planning at least 12 months in advance. December and January are particularly busy times and typically are fully booked up 10 months ahead. For the most popular Fly & Cruise trips or those incorporating South Georgia, 18 months ahead isn't too early. Is it less expensive to travel in November & March? Yes it's true, the Shoulder Season months of November and March tend to be priced approx. 10-15% less than during the High Season (December - end February) and as a result are a good place to look for the budget-conscious or bargain-hunter. The reason for this is partly the less predictable weather and slightly lower wildlife numbers, but it's also simply the case that many who live in Northern Hemisphere countries like to holiday during their worst winter months. In our opinion a great time to travel is in early December when it's still Shoulder Season pricing but you get all of the benefits of High Season. Are there any advantages in booking early? ​There certainly are: as well as securing your first choice, with many of the ships offering really quite generous early booking incentives of up to $1,500 per person to those willing to commit early, getting organised can really pay dividends. Can I wait until the last minute for a late deal? 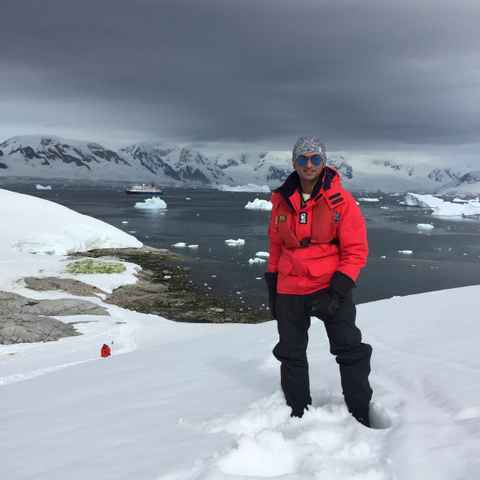 Given the ​strong ​demand for Antarctic cruises​ ​boat ​operators rarely need to ​resort to offering any ​late availability discounts - particularly on the more popular ships and voyages - as ​cabins ​are normally all booked months ago in advance. Any remaining unsold cabins tend to be left on the shelf for a reason and choice will be poor at best, so it's not an approach we advocate. However, if you're flexible on dates and don't mind paying for ​overinflated ​flights​ ​there are normally odd cabins available. Absolutely no glitches and lots of pleasant surprises including aircraft carrier sized icebergs, Zodiac trips through ice fields, climbing the volcano on Deception Island, and up-close-and-personals with penguins, seals, and humpback whales. The continent is ineffable: words fail. I was extremely satisfied with the voyage I took. It was very helpful to receive first hand information from someone who knows the region very well. Swoop's service prior to the voyage was good as well- the frequent mailers and tips helped a lot. Swoop's service was excellent start to finish; thorough, friendly, helpful, and personal. I would recommend Swoop to anyone.